Cartoonist and humorist David Rees mashes up Taylor Swift and Aphex Twin tracks and the result is surprisingly good. Taylor Swift is big. I mean, not physically big - although she is fairly tall at 5-foot-10-inches - but there aren't many musicians with a bigger current presence than the 24-year-old singer-songwriter. To this date, Swift has already won seven Grammy Awards, 15 American Music Awards, 12 Billboard Music Awards, earned a cool $64 million in the past year, and even acted in a movie in which Jeff Bridges and his beard were cast. In a sense, Taylor Swift is everywhere, telling you to drink Diet Coke and inspiring young women across the country that they too can have an eight-second track of white noise reach the top of the Billboard charts. Naturally, T-Swift's success and style reminded cartoonist and humorist David Rees of Aphex Twin, the stage name of reclusive electronic artist Richard D. James, so much so that Rees created Aphex Swift, a mashup album consisting of tracks from the two artists that work surprisingly well together. Suprised? You're likely not alone, although Rees summed up the inspiration for Aphex Swift on his blog for people a bit taken back by his musical hypothesis. I actually think Richard D. James (Aphex Twin) and Taylor Swift have a lot in common besides their songwriting talents — or, at least, they each have characteristics more commonly associated with the other. Rees goes on to sum up his two main points that Richard D. James is a "romantic cornball" just like Swift and that Swift is just as scary as the man who made "Come to Daddy." Given that Swift has an army of fans who will defend here relentlessly despite any shred of logic as rapper El-P learned recently, I'll totally get behind the later suggestion. 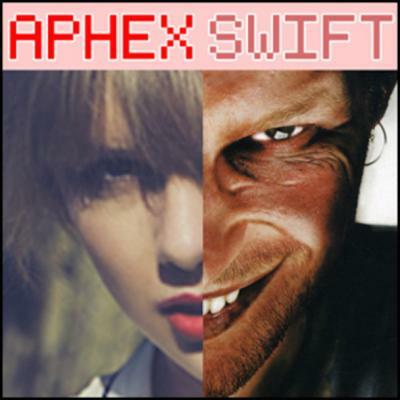 Regardless of your opinion of Swift and James, you should take the time to liste to Rees' Aphex Swift, because it's pretty damn good. Seriously, check it out below.